A Norwegian Air Boeing 737 Max 8 is parked on the tarmac at Helsinki Airport on Wednesday after the airplane model was grounded in most of the world. On Wednesday, the United States followed Europe, China and other countries in grounding the Boeing 737 Max airplane after a plane crash in Ethiopia last weekend killed all 157 people on board. Investigators are still working to determine exactly what went wrong, but this was the second 737 Max 8 to crash in nearly five months — a Lion Air crash killed 189 people off the coast of Indonesia in October. And there are similarities between the crashes which prompted the planes to be grounded. From rebookings to refunds, from jetliner parking to pay for idled flight crews, plane groundings are pricey. About 370 of the jets are grounded around the world. "This is costing millions of dollars per day," says Phil Seymour, who runs an aviation consultancy called IBA. And it's not just the airlines on the hook. Boeing may have to pay up, too. "Typically, once an airline takes the aircraft, Boeing makes some guarantees in terms of the performance of that aircraft, and one of them is that the aircraft should be airworthy," says Chris Higgins, an analyst at Morningstar. And if it's not, airlines will demand compensation. 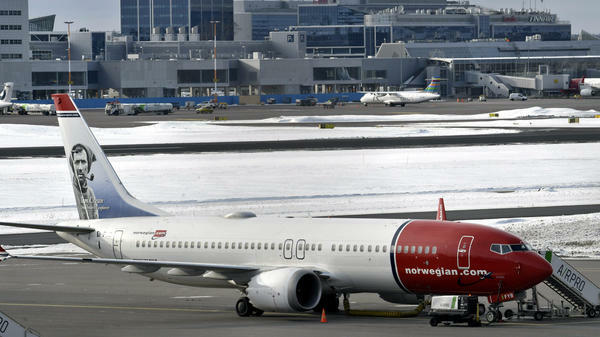 Norwegian Air CEO Bjorn Kjos said his company, for one, plans to do so. "We will send this bill to those who produce this aircraft," he said. And Seymour says it's important that Boeing keep those airlines happy: They're repeat customers, after all. It's unclear how much those payments will be. But there are clues from the last time the FAA grounded an airplane in the U.S. — in 2013, when the Boeing 787 Dreamliner had a problem with lithium-ion batteries catching fire. "Boeing had to pay out airline compensation for that grounding," Higgins says. "They never disclosed how much it was, but guesstimates at the time put it around $500 million." And that was with a much smaller fleet of airplanes affected. There's another way the 737 Max groundings could hurt Boeing. The company has a lot of future deliveries lined up and airlines might refuse or delay those deliveries. Boeing says it has received more than 5,000 orders for the fuel-efficient plane from more than 100 customers worldwide. Analysts at Jefferies estimated as the groundings began on Monday that a two-month halt in deliveries could cost Boeing $5 billion in revenue. Boeing can afford to take a hit. Last year its revenue topped $100 billion and it has been raking in profits. But Higgins notes there's more at stake. "A worst-case scenario, if you see deliveries kind of level out, there's a lot of implications beyond Boeing," he says. Boeing makes planes, but other companies make the engines, the seats, the landing gear and fuselage. "Seventy percent, 80 percent of most aircraft that's done by the supply chain, not by Boeing," Higgins says. "There are thousands and thousands of jobs and hundreds of companies that are supplying into Boeing's final assembly lines." The ripple effects of the groundings could hurt Boeing's suppliers across the U.S. and around the world. Boeing's 737 MAX airplane was supposed to be the company's safest bet - its best-selling jetliner ever. Now that the United States has grounded the planes, it may be Boeing's greatest cost. There is possible reputational damage to the brand. There's also a more immediate price to pay, as NPR's Camila Domonoske reports. CAMILA DOMONOSKE, BYLINE: From rebookings to refunds, from jetliner parking to pay for idled flight crews, plane groundings are pricey. And now some 370 Boeing jets are grounded around the world. Phil Seymour runs an aviation consultancy called IBA. PHIL SEYMOUR: This is costing millions of dollars per day. DOMONOSKE: And it's not just the airlines on the hook. Boeing may have to pay up, too. Chris Higgins is an analyst at Morningstar. CHRIS HIGGINS: Typically, once an airline takes the aircraft, Boeing makes some guarantees in terms of the performance of that aircraft. And one of them is that the aircraft should be airworthy. DOMONOSKE: And if it's not, airlines will demand payment for their losses. Norwegian airline CEO Bjorn Kjos says his company plans to ask Boeing to pony up. BJORN KJOS: We will send this bill to those who produce this aircraft. DOMONOSKE: And Phil Seymour says it's important that Boeing keep those airlines happy. They are repeat customers, after all. We don't know how much this could cost Boeing, but we can get a clue from the last time an airplane was grounded by the FAA here in the U.S. That was in 2013. The Boeing 787 had a problem with its batteries. Here's Higgins at Morningstar. HIGGINS: Boeing had to pay out airline compensation for that grounding. They never disclosed how much it was. But guesstimates at the time put it around $500 million. DOMONOSKE: And that was with a much smaller fleet of airplanes affected. There's another way these groundings could hurt Boeing. The company has a lot of future deliveries lined up. Five thousand 737 MAXs have been ordered. Airlines might refuse or delay those deliveries if the planes are going to be grounded anyway. Analysts at Jefferies crunched the numbers on Monday. They estimate that a two-month halt in deliveries could cost Boeing 5 billion in revenue. Boeing would not comment on financial implications, but the company can afford to take a hit. Last year, its revenue topped 100 billion, and it's been raking in profits. But, Chris Higgins at Morningstar notes, there's more at stake. HIGGINS: Worst-case scenario is you see deliveries kind of level out. There's a lot of implications beyond Boeing. DOMONOSKE: Boeing makes planes, but other companies make the engines for those planes - and the seats, the landing gear, the fuselage. HIGGINS: Seventy percent, 80 percent of most aircraft - that's done by the supply chain not by Boeing. There are thousands and thousands of jobs and hundreds of companies that are supplying into Boeing's final assembly lines. DOMONOSKE: The ripple effects of the groundings could hurt Boeing's suppliers across the U.S. and around the world. Camila Domonoske, NPR News. Transcript provided by NPR, Copyright NPR.